ACTA Medya production of UltraHD transmissions in Turkey. Istanbul, December 2015: Mediapro Turkey and ACTA Medya provided the technical infrastructure and crewing for three significant Ultra HD productions between December 7th and 11th. They included the Galatasaray vs Astana Champions League match, which was the first ever UEFA game broadcast free-to-air in 4K, as well as the world's first 4K video conference produced from five locations. The productions were made possible by the co-operation between Mediapro Turkey, ACTA Medya, Türksat, Samsung and TRT 4K. In Europe four soccer matches were broadcast in 4K, two of them produced in Turkey. The Galatasaray vs Astana match was transmitted using eight Ultra HD cameras, Ultra HD lenses and HEVC H265 encoding. The match - the first ever free-to-air, 4K Champions League game - was broadcast by TRT 4K and sponsored by Samsung. One of the leading TV platforms in Turkey, TiviBu, hosted the 4K production of the match between Fenerbahce vs Celtic in the UEFA Europa League. Mediapro Turkey and ACTA Medya provided the technical infrastructure and the crewing and the match was delivered by the European Broadcasting Union (EBU) to other countries in Ultra HD format. The match in which Fenerbahce advanced to the next round with a 1-1 score, was broadcast live with eight UHD cameras and Ultra HD lenses on TIVIBU SPOR. 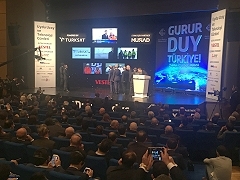 The event was transmitted on TRT 4K and the graphics of the broadcast were prepared by the local software team, Konatus. The same transmission was made in High Definition (HD) and Standard Definition (SD) and was delivered free-on-air without a logo for other TV Channels to broadcast. 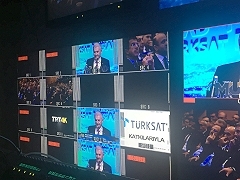 The 18 MHZ frequency was used for the Ultra HD video conference that is the first transmission on the 4B satellite of Turksat at 50 degrees. PIKO 4 Encoder and modulators produced by Kizil Elektronik in Turkey were used in the transmission and the performance of the devices got full marks from the broadcasters.